Infestations of this beetle occur mainly on wheat, especially on less-hairy-leaved cultivars. Various other cereals (but not oats), and grasses such as cocksfoot, are also attacked. Adults and larvae cause direct damage to the foliage of host plants. They graze away longitudinal strips of epidermis from the upper surface of the leaves, between the veins, the damaged tissue appearing pale brown to whitish. Infestations on flag leaves are especially important and the loss of photosyn-thetic tissue can have an adverse effect on plant development; spring cereals are more susceptible than winter crops. The beetles are also capable of transmitting viruses, notably cocksfoot mottle virus. Although often of considerable significance in continental Europe, in the British Isles this pest is unimportant and far less abundant than the following species. Adults of this univoltine species hibernate amongst plant debris and in various other situations, reappearing in April. They then invade wheat crops to feed on the leaves. Eggs are laid about 6 weeks later, mainly on the upper leaves of host plants. They usually hatch within 10 days. The sluggish larvae feed openly on the leaves for up to 2 weeks and pass through four instars; most individuals occur on the flag leaf. When fully grown, each spins a white, cottonwool-like cocoon (c. 6mm across), usually on the upper surface towards the base of a leaf. Adults emerge in about 2 weeks, usually from late July onwards. 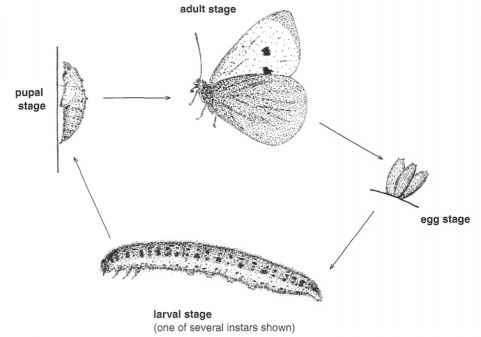 The total life-cycle from egg to adult occupies about 5 weeks (cf. Oulema melanopa, below) but, especially at the pupal stage, may be extended considerably by lower than normal temperatures. The egg-laying period tends to be protracted so that, during the summer, all stages of the pest often occur together. Development of the pest is favoured by high spring and summer temperatures; cool and wet conditions are detrimental to larval and pupal survival. Adult 3-4 mm long, mainly black to bluish-black; elytra distinctly metallic; antennae prominent, 11-segmented; thorax relatively broad (Plate 4a) (cf. Oulema melanopa, below). Egg 1 mm long, shiny ochreous-yellow. Larva up to 5 mm long; head black; body dirty yellow and shiny, coated with slimy brownish to blackish excrement (except in the final stages of development) (Plate 4b) (cf. O. melanopa, below).